Intelligent Systems for Molecular Biology is an international conference sponsored by the International Society for Computational Biology, over the past ten years, the ISMB conference has grown to become the largest bioinformatics conference in the world. For 2002, more than 1800 delegates from nearly 40 countries are expected to attend. This year's conference will highlight the work of many outstanding researchers in such diverse areas as: machine learning, pattern recognition, knowledge representation, databases, combinatorics, stochastic modeling, string and graph algorithms, linguistic methods, robotics, constraint satisfaction, and parallel computation. Biological areas of interest include: protein structure, protein function, genomics, proteomics, molecular sequence analysis, evolution and phylogenetics, molecular interactions, molecular structure, gene expression, metabolic pathways, regulatory networks, developmental control and systems biology. The four-day conference and associated tutorials will be held at the Shaw Conference Centre, an innovative, glass-tiered centre, overlooking Edmonton's scenic river valley. The conference will feature original, refereed papers, software demonstrations, posters, and introductory and advanced tutorials. There will also be a job fair, and an exhibition of hardware and software vendors. Papers will be published in an archival proceeding and indexed in the Medline database. The proceedings will be provided to participants as a bound volume at the conference. We invite any and all individuals with an interest in bioinformatics, biostatistics, mathematical biology, or computational biology to come to Edmonton to enjoy some western hospitality. 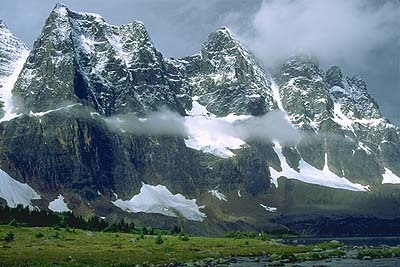 A picture of Tonquin Valley in Jasper National Park, located about a three-hour drive west of Edmonton.